Diizche Safari Adventures is committed to improve both the knowledge base and skills of big-game hunters through our published media while promoting the safe use of firearms and fostering wildlife conservation. We are a nationally and internationally known state recognized entity that fosters proficiency in, or promotes education about, firearms. This is done through exhibitions, displays, educational projects and classes about firearms that we sponsor or conduct. Shawn has presented for Massad Ayoob and the Massad Ayoob Group MAG80 class graduates regarding firearms and the use of deadly force. As many of you know, we sponsor an annual shooting event and competition in the United States (Safari Rifle Challenge World Championships). In 2018 this will be the 8th year of this annual event. In addition, we have sponsored and supported international shooting events conducted in Germany. 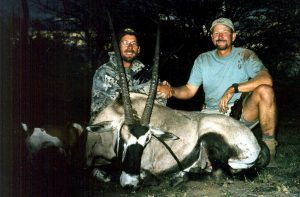 Diizche Safari Adventures is a proprietorship publishing company that has developed from a desire to educate through our media and by detailing hunting techniques and training information. Our primary goal is to educate and improve the skills of hunters by creating a platform from which they can expand their knowledge through our published works and entertainment media. We offer books, DVDs, and also sell a variety of lifestyle products that include accessories, hats, apparel, artwork, and native jewelry. Diizche Safari Adventures, in some ways, originated in 1990 through the establishment of Diizche Traders. 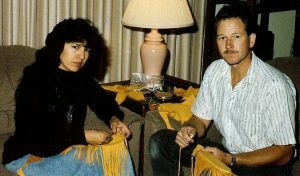 Shawn Joyce, the founder of Diizche Traders, had an interest in bowhunting that took him throughout the United States. During these travels, Shawn began to meet many different people whose common bond was a joy of hunting and a great respect for wildlife and the wilderness in which he spent so much of his time. Constantly searching for ways to more fully utilize the game animals he killed, Shawn found ways to use the hides, horns, and other usable items following a hunt. This helped lead toward developing Shawn`s interest in crafting traditional products which were made available through Diizche Traders. Through his travels, Shawn began sharing his thoughts and philosophies on hunting with those in the Native American community where he sometimes hunted. 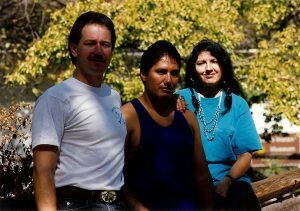 Shawn`s frequent exposure with the Native American community enabled him to experience a Native American walk in spirituality and traditional ceremony. 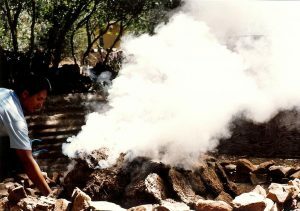 Shawn later began creating traditional pit-fired Apache pottery with Larry Russell, a Chiricahua Apache potter interested in reviving the traditional methods of Apache pottery making. These traditional Apache pots, made by Larry, may still be found at art galleries today in Sedona, Arizona. Through his experience hunting in Africa and preparing for dangerous game hunting, Shawn came to understand a need existed to develop dangerous game hunting material to better prepare the dangerous game hunter. While still honoring the Native American art component of Diizche Traders, Diizche Safari Adventures will also focus on dangerous game hunting, and hunter preparation. This will include hunting tactics, equipment, dangerous game anatomy, hunter`s psychological preparation, and other training aspects. Dangerous game hunting educational materials and training curriculum will be developed by Shawn and others to better prepare dangerous game hunters should the unthinkable encounter become a moment of reality during a hunt. This will be done through exhibitions, displays, educational projects, entertainment media, and classes about firearms and hunting that we sponsor or conduct. Please visit our website for future links and additional dangerous game hunting information as they become available. Shawn served for 6 years in fire, rescue, and ambulance service. He worked as a firefighter, engineer, EMT-I, rescue squad member, and also performed both field and office management for a private ambulance company while working in the field as an EMT-II. He was appointed Base Hospital EMT-II Representative to the governing multi-county regulatory agency. Shawn Joyce is a veteran Deputy Sheriff with 15 years of real world law enforcement experience in California (Nevada and Sacramento County). He received his California Department of Justice Commission on Peace Officer Standards and Training (POST) Advanced Officer Certificate. His career included assignments in Airport Bureau, Correctional Services-Maximum Security, Training Officer Program, Patrol Services-North Division, Special Operations Detail, Marine Enforcement, Mobile Tactical Unit/Riot Response and Counter Sniper, Patrol Tactical Long Rifle Unit and various other areas of assignment. Shawn also served as the Co-Chairman of the Patrol Communications Enhancement Committee, Liaison to Department of Social Services/Children`s Protective Services, and the Communications Center. After honorably retiring from law enforcement, Shawn served through a non-profit provider and delivered services that helped people overcome barriers to success and become self-sufficient. In this role, Shawn worked with the California Division of Adult Parole Operations Northern Region Parole Units in Sacramento County. This included direct work with Sacramento North, South, and Metro Parole Unit Officers and their directly supervised parolees. Shawn also conducted in facility training for male Level IV prison inmates incarcerated in the California State Prison. Shawn held certification from the California Certification Board of Alcohol and Drug Counselors as a Certified Alcohol and Drug Counselor II (CADC II). Shawn founded his own company, Diizche Traders before breaking-off to his current endeavor known as Diizche Safari Adventures. While performing the day to day challenges of managing and running his own international business, Shawn continues to keep his hand in emergency preparedness work. For the past 14 years, Shawn has served a 10-county Joint Powers Government Agency in Northern California as the Emergency Preparedness Coordinator. He oversees consultants while also working closely with Agency staff, EMS provider agency personnel, base/receiving hospital personnel, State and local agencies, and the California Office of Emergency Services Region III and Region IV Regional Disaster Medical Health Specialists. The goal is to establish and maintain a standard EMS role in Emergency Preparedness. Shawn also performs emergency preparedness grant writing, management, and coordinator duties including fiscal management components of the Hospital Preparedness Program (HPP).This is a federal program managed nationally by the Office of the Assistant Secretary for Preparedness and Response (ASPR), Office of Emergency Management (OEM). At the state level this program is managed by the California Department of Public Health-Emergency Preparedness Office (CDPH-EPO). Shawn works closely with this agency and the Program Manager/Contract Compliance Officer helping to assure local, regional, and statewide preparedness with this program. In his Emergency Preparedness Coordinator role, Shawn provides regional leadership, programmatic oversight, and funding to improve surge capacity and enhance community and hospital preparedness for all hazards and public health emergencies. The program’s overall national goal is to strengthen medical surge and other Healthcare Preparedness Capabilities across the nation. The primary focus areas are Healthcare System Preparedness, Healthcare System Recovery, Emergency Operations Coordination, Fatality Management, Information Sharing, Medical Surge, Responder Safety and Health, and Volunteer Management. In addition to the HPP activity described above, Shawn also manages an additional and unique program known as the HPP Ebola Preparedness and Response Program with the CDPH-EPO and the California Office of Emergency Services RDMHS Region III in Northern California. Ebola preparedness and response activities and planning are intended to ensure the nation’s health care system is ready to safely and successfully identify, isolate, assess, transport, and treat patients with Ebola or patients under investigation for Ebola, and that it is well prepared for a future Ebola or other infectious disease outbreak. Shawn participated closely in the development and implementation of the California Mutual Aid Region III Regional Infectious Disease Transportation Plan. He continues his work in this program working closely with Regional Ebola Transport Providers to help support and ensure their readiness.